The Distillery Football Club was formed in 1880. 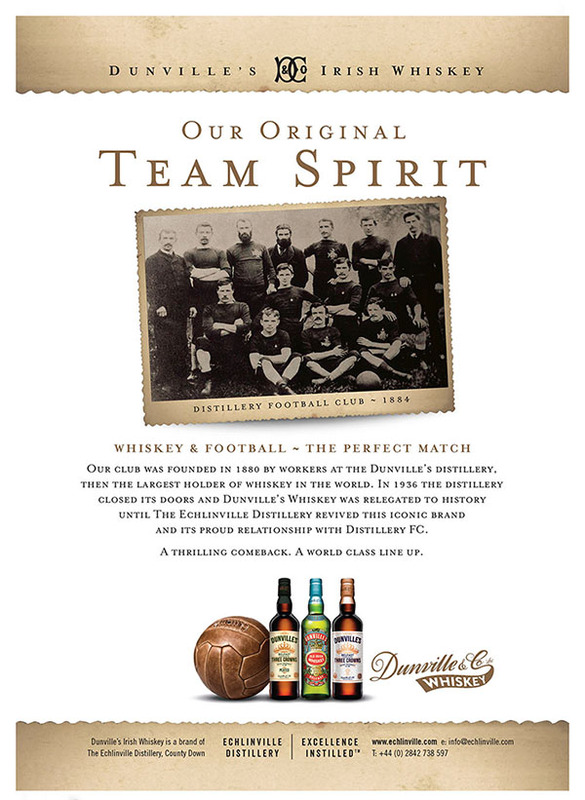 The directors of Dunville & Co., especially James Barr, gave the football club their support and filled in a waste pond at the back of the distillery to create the club's first football ground. The club was based at Grosvenor Park in Distillery Street until 1971, after which it shared Skegoneill Avenue and Seaview with other clubs. In 1980 it moved to New Grosvenor Stadium, Ballyskeagh, County Antrim. The Distillery Football Club changed its name in 1999 to Lisburn Distillery Football Club, after the location of its present home ground. 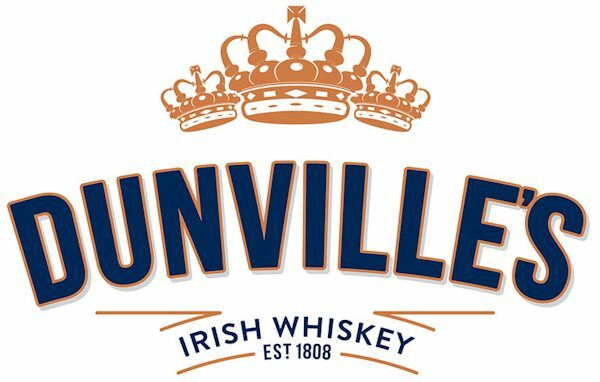 Since the 2016–2017 season its back of shirt sponsor has been The Echlinville Distillery, who have resumed the production of Dunville's Whiskey. Lisburn Distillery wish to announce that following job offers from another club [Harland & Wolff Welders Football Club] the management team of Colin McIlwaine and George O'Boyle have today tendered their resignations as managers at the club. 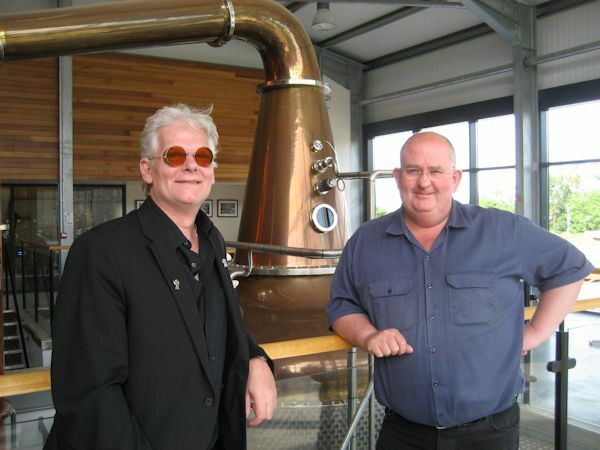 The club thanks Mac and George for all their efforts whilst at Distillery and wish them every success for the future. 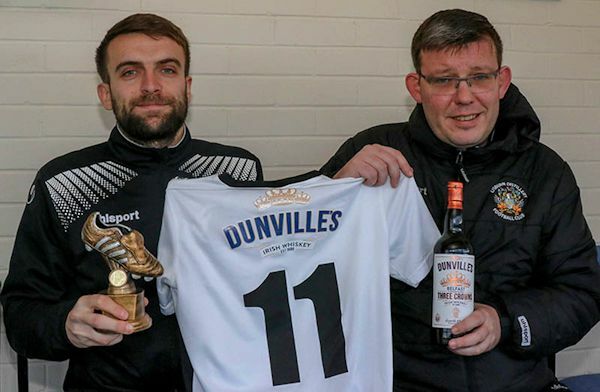 The Dunville's Whiskey Player of the Month for March 2019 was won by Daire Rooney. Daire (centre) was presented with his award by Aaron Harris and Stephen Curley (right). Photograph by Hunter. 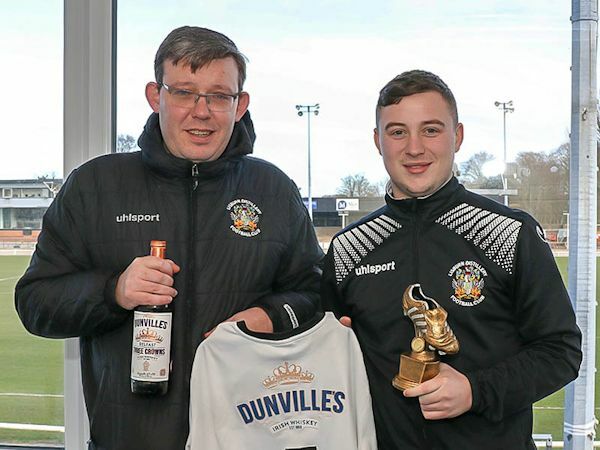 Jonah Nicholl (right) won the Dunville's Whiskey Player of the Month for February 2019. He is pictured receiving his awards from Lisburn Distillery manager Colin McIlwaine. Photograph by David Hunter. 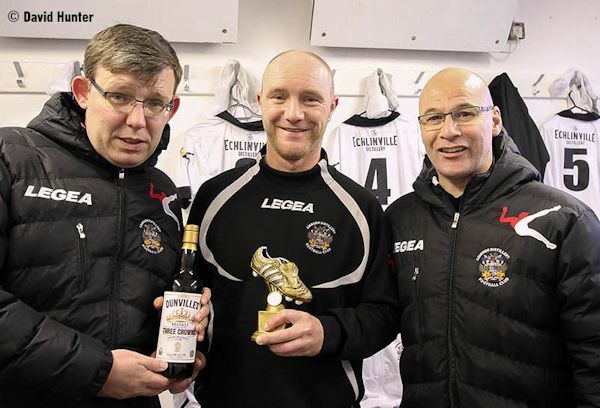 Jonny McCaw (right) won the Dunville's Whiskey Player of the Month for January 2019. He is pictured receiving his awards from Lisburn Distillery manager Colin McIlwaine. Photograph by David Hunter. 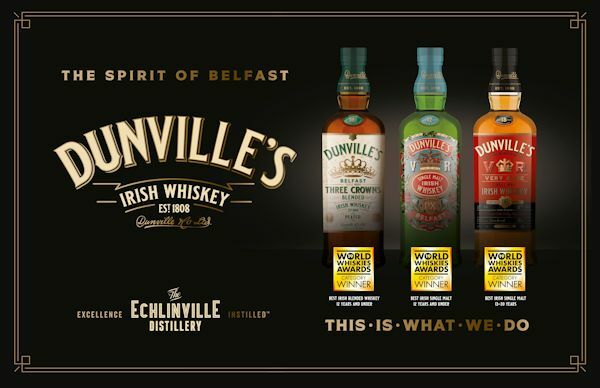 Congratulations to our good friends at The Echlinville Distillery: Dunville's net THREE awards at World Whiskies Awards. 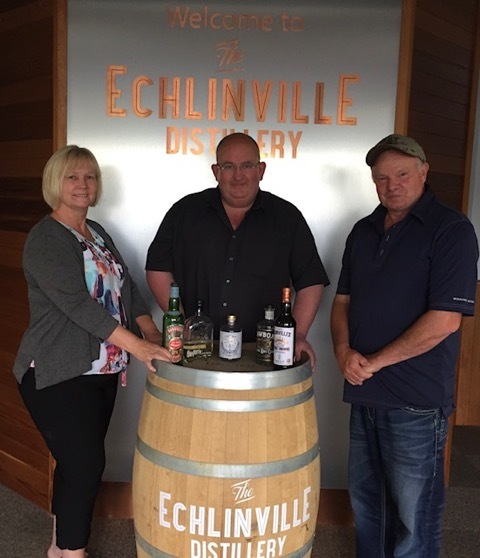 More on Dunville's journey so far on Barry Chandler's YouTube video: Stories and Sips, Episode 22: "Echlinville Distillery – Northern Ireland's Whiskey Upstart". As our pictures show, our shirt made it safely to Thomas S Dunville, in Indiana, USA. 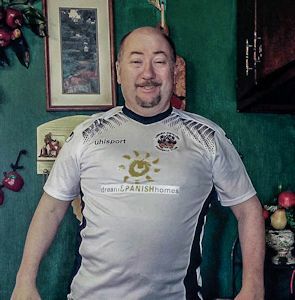 Thomas saw our recent shirt advertisement on social media and given his family connection – he can trace his lineage back to William Dumvill who died in 1793 and is buried in Shankill Cemetery, Belfast – he got in touch with a simple message: "I need one of those shirts." William Dumvill's son, Richard Andrew Dumvill (the family surname was later changed to Dunville), went from Belfast to South Carolina in 1773 – that was a long journey by ship and horseback then. Today our shirt took five days to reach Indiana, making it through last week's polar vortex across the USA (-11° but feeling like -36° with the wind-chill effect in Indiana). "Thank you again for all the effort" said Thomas from a then very cold part of America. "You have helped me connect to my family's history and the good things it helped create." 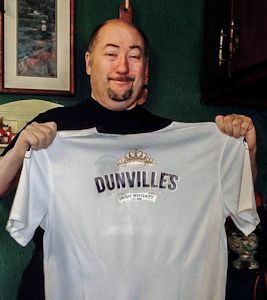 Our thanks to Thomas for getting in touch and purchasing one of the last shirts available this season – the Dunville's name (and award-winning whiskey) still to the fore after so many centuries. 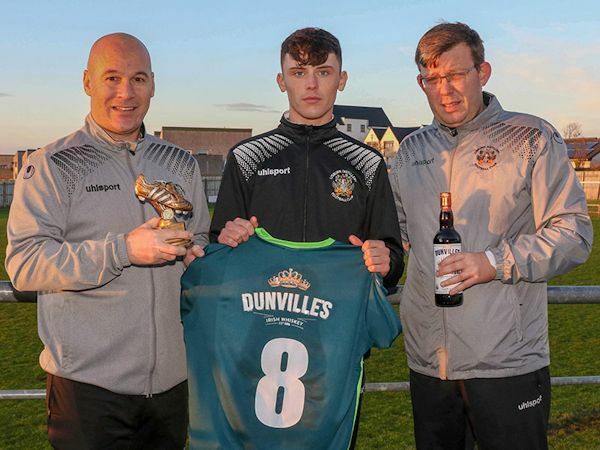 The Dunville's Whiskey Player of the Month for December 2018 was won by Barry Moore. He is pictured receiving his awards from Lisburn Distillery manager Colin McIlwaine (right). Photograph by David Hunter. 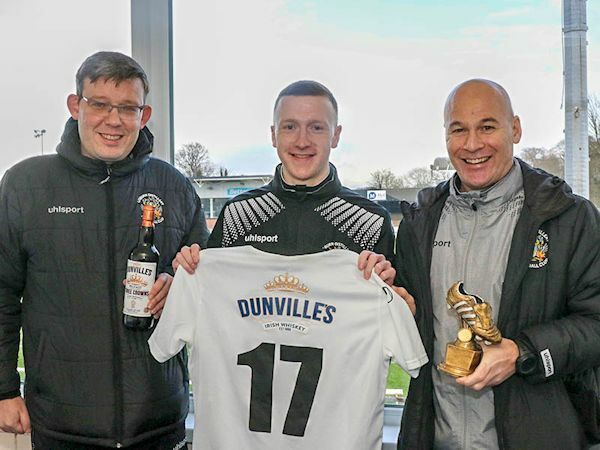 The Dunville's Whiskey Player of the Month for November 2018 was Alan McMurtry, pictured receiving his awards from Lisburn Distillery's management team of George O'Boyle (right) and Colin McIlwaine. Photograph by David Hunter. 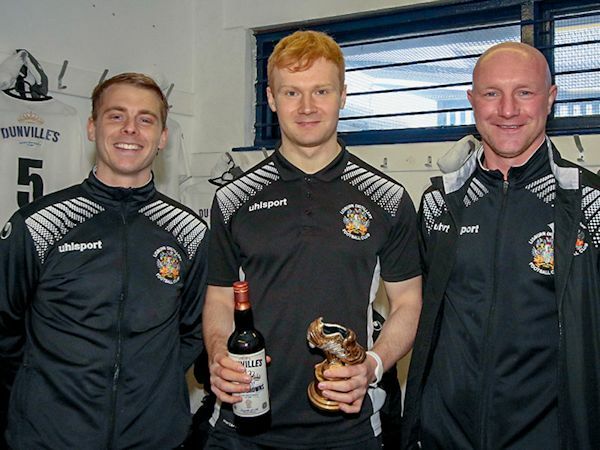 The Dunville's Whiskey Player of the Month for October 2018 was Conor Curran, pictured receiving his awards from Lisburn Distillery's management team of George O'Boyle (left) and Colin McIlwaine. Photograph by David Hunter. 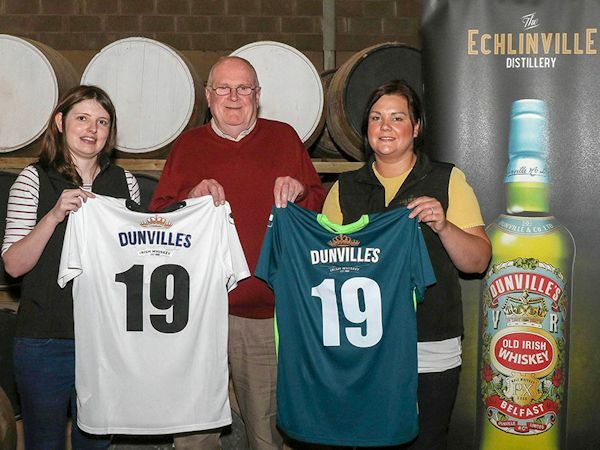 On the 31st July 2018, the link between Dunville's and Lisburn Distillery Football Club was strengthened when the club announced that the "Dunville's" name would be on the back of the playing shirts thanks to the continued sponsorship by The Echlinville Distillery. The spirit still flows on and off the pitch. Pictured with the 2018-2019 shirts at Echlinville Distillery are Clare Quinn (Sales, The Echlinville Distillery), Terry Thompson (Director, Lisburn Distillery Football Club) and Suzanne McCullough (Marketing, The Echlinville Distillery). Photographs above and below by David Hunter. Kindred spirits: Christopher Dunville, great-grandson of Robert Lambart Dunville (1893-1931), the fifth and last chairman of Dunville & Co. Ltd., and Shane Braniff, owner of The Echlinville Distillery, at The Echlinville Distillery on 5 July 2017. Photograph by Sam Christie. 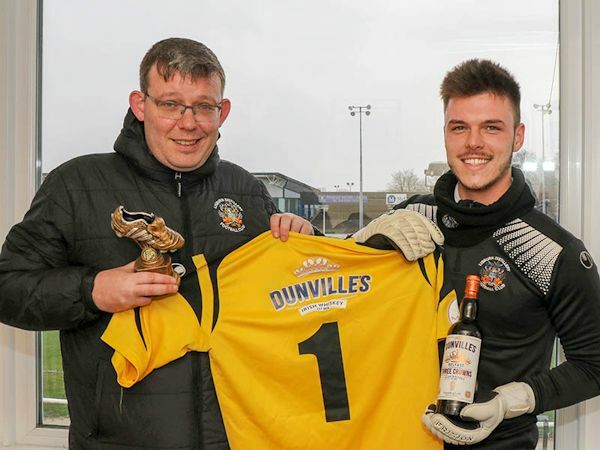 The Echlinville Distillery have resumed the production of Dunville's Whiskey and they are one of the sponsors of Lisburn Distillery Football Club. Kirsten Young, granddaughter of William Gustavus Dunville (1900-1956) and great-granddaughter of John Dunville Dunville (1866-1929), the fourth chairman of Dunville & Co. Ltd., Shane Braniff, owner of The Echlinville Distillery, and Tom Young, Kirsten's husband, at The Echlinville Distillery on 27 June 2017. The Echlinville Distillery Player of the Month for October 2016 was Stephen Curley. Following a month with three clean sheets, goalkeeper Tony Galbraith and defenders Padraig McParland, Tirrell McCrory, William Wharry, Darren Doherty and Timmy Clarke all scored well, but it was Stephen who came out on top. He received his award from manager Colin McIlwaine (left) and assistant manager George O'Boyle (right). Congratulations to Stephen on his award. We would also thank Shane Braniff and our friends at The Echlinville Distillery for sponsoring and providing the monthly awards. The award this month was a bottle of Dunville's Three Crowns Whiskey – remarkable to think that after so many decades, the Dunville's name and spirit was present in the Distillery dressing room again! 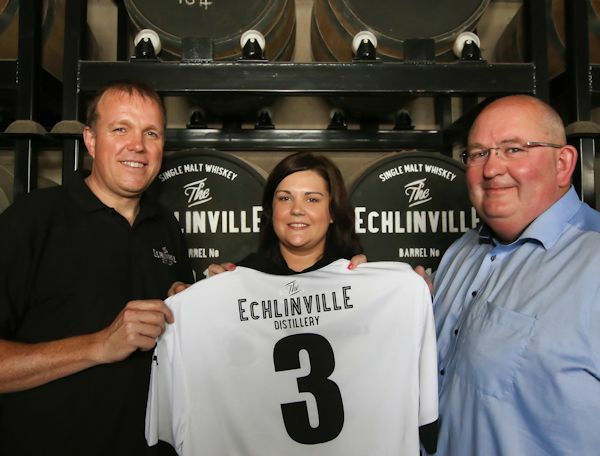 9 August 2016: The Echlinville Distillery based in The Echlinville Estate near Kircubbin, Northern Ireland is now the back of shirt sponsor for Lisburn Distillery Football Club. Pictured with the club's home shirt at the Echlinville Distillery are Graeme Millar (Echlinville Operations Manager), Suzanne McCullough (Echlinville Office, Sales & Marketing Executive) and Shane Braniff (Owner – Echlinville Distillery). Photograph by David Hunter. A whiskey distillery in Co Down – only the second to open in Northern Ireland – is investing £1.5m and creating 15 jobs as it aims to sell its drinks all over the world. This year Echlinville Distillery in Kircubbin, Co Down, was granted the first licence to distil spirits in Northern Ireland in over 130 years – and could soon expand to include a restaurant, museum and visitors' centre. Managing director Shane Braniff launched the successful Feckin Irish Whiskey brand in 2005, which has become a huge hit in the USA, where demand for Irish whiskey is skyrocketing. The company is now planning a range of drinks which can be sold almost immediately – without having to wait the three years for whiskey to mature – and also plans to develop a premium and super premium malt whiskey. Mr Braniff founded Echlinville Distillery in 2012 on his own 18-acre estate, located at Rubane in Kircubbin. He said he also intends to open a visitor centre and whiskey museum and restaurant to draw more tourists to the Ards Peninsula. "Irish whiskey is now the fastest growing brown spirit worldwide and demand is currently out-stripping supply in the US and many other markets," he said. "In addition to the existing Feckin whiskey brands, we have recently relaunched Dunville VR Irish Whiskey, once one of the best known brands, until the closure of the distillery in Belfast that produced the spirit over 80 years ago. "The Dunville whiskey is also unique in that is the only one distilled using grain barley that we are growing at Kircubbin. "This ensures complete traceability and provenance of all our spirits. "We are also sourcing as much equipment and other supplies from other Northern Ireland businesses. Echlinville Distillery will step up production of Irish whiskey and other spirits for export within the next few months. "The company has recently launched a Patron's Promise initiative that provides whiskey devotees and investors the opportunity to buy casks of malt in advance of official launch." Invest NI has offered Echlinville Distillery over £216,000 in management and marketing support towards the project and the company has also recently benefited from research and development assistance. The export drive comes amidst a renewed interest in Northern Ireland's brewing and distilling industries. Last week, Rademon Estate Distillery officially launched its first product, Shortcross gin, while Hercules Brewing Company has announced it is creating a new Belfast-inspired lager called Yardsman. On Saturday 27 November 2004, Christopher Dunville, great-grandson of Robert Lambart Dunville (1893-1931), the fifth and last chairman of Dunville & Co. Ltd., visited Lisburn Distillery Football Club and presented fifteen silver platters to the top goal scorers (fifty or more goals). The event also celebrated the forthcoming 125th anniversary of the founding of the club. Back row: Darren Armour, Peter Watson, Jim McCloskey, Joe Meldrum, Gerry McCaffrey, Tom Cleland, Ferris Lunn. 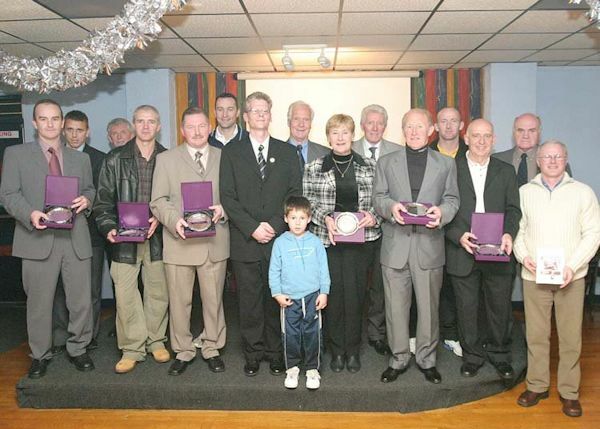 Front row: Philip Dykes, Francis Smith, Bertie McMinn, Christopher Dunville, Joy Collins (daughter of all-time Distillery goal-scorer Sam "Bull" McAdam), Roy Welsh, Johnny Cochrane, Dawson Simpson (club historian). Centre front: Dillon Cummins. Photograph by David Hunter. Old map of west Belfast showing Dunville & Co.'s Royal Irish Distilleries to the left of the centre, the Distillery Football Club Ground to the north of it, and Dunville Park at the top left. Part of a painting, showing the Distillery Football Club Ground. To the lower right of the football ground there is a sign which reads "Distillery Footba", with the "ll" hidden behind a building. The tall chimney in the foreground is part of the Royal Irish Distilleries. Much of the information on this page, and many of the photographs, were very kindly provided by Terry Thompson and David Hunter.